LENScience Face-to-Face programmes were designed to provide opportunity for engagement between schools, scientists and related communities. They were active from 2006 - 2016. 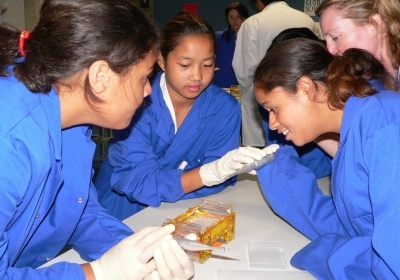 Evaluation involving participating schools demonstrated that these programme supported engagement in learning, development of capabilities associated with science and health literacies, nature of science understanding, and when used in conjunction with school-based programmes, action-oriented behaviours promoting improved health. These programmes are no longer active, however all resources will remain on this site. LENScience Face-to-Face programmes were active from 2006 to 2016. They provided opportunities for engagement between schools, scientists and related communities. While LENScience acknowledges the value of resources that are made available via the web and strongly encourages the use of interactive e-learning events, we believe that where possible students should at some stage have the opportunity for face-to-face contact with a university setting and scientists. Our Face-to-Face programmes enabled this contact, and allowed students to visit our specialist classroom set in the midst of the Liggins Institute community, enabling Year 7-13 students to use state of the art laboratory equipment not found in schools. All programmes were designed by experienced science educators working within scientific institutions. The programmes explored health related socio-scientific issues, linking to concepts developed in the New Zealand Curriculum. The development of scientific literacy to support long term health, social and economic wellbeing underpins the programmes which are supported by pre and post learning activities for schools. Ideally these programmes were used in conjunction with the LENScience learning modules. The programme concept is transferrable and has the potential to be used in all science learning areas as demonstrated by Reach Out Lab at Imperial College, modelled on the LENScience concept by Professor Lord Robert Winston. A Year 13 biology programme linking students to current New Zealand research. A Year 11 science programme exploring a socio-scientific issue of relevance to New Zealand communities. A Year 10 programme exploring the exciting world of DNA and science. Year 9-10 students explore how our early life environment affects us as we mature through puberty and beyond. Year 7-9 students explore why scientists are so interested in the effect of nutrition on health throughout life.